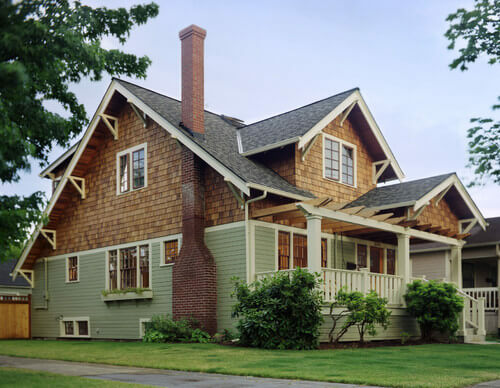 Shake siding offers a timelessly charming look, unlike any other house exterior. It is an ideal siding for Cottage, Bungalow, Arts & Crafts architectural house styles. Most people associate shake siding with natural cedar wood shakes, and rightfully so. 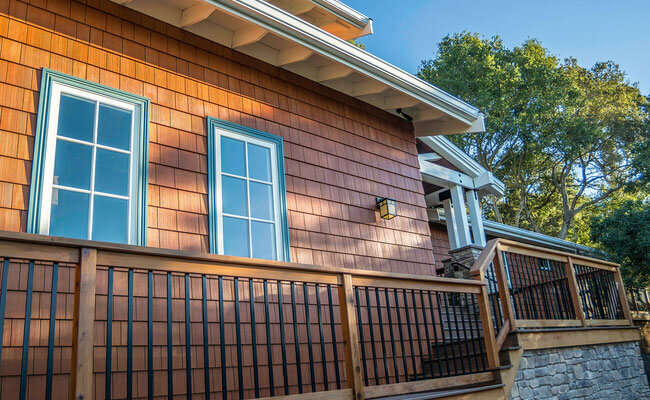 Cedar wood shakes is a classic siding material, that has been used on houses for centuries. However, today, there are other engineered siding material options. They offer the rustic look of shake at a lower price, and without costly regular maintenance of wood. Here are the 4 Best shake siding materials that may be a great fit for your house and remodeling budget. Use our siding estimating tool to quickly and accurately calculate and compare the cost of materials for your home. Vinyl siding remains the Number 1 Best Selling material in the US, because it offers the best value on all siding styles. Shakes is no exception. Today, manufacturers have cutting edge technology that gives vinyl siding the premium look of natural wood shakes. So much so, that even many designers and home inspectors are no longer able to tell the difference between real cedar shakes and the vinyl replica. Of course, the most attractive selling point for vinyl shake siding is the price. It costs $3-5/sq.ft. for materials and installation. So if you have a 2,000 sq.ft. house, your total siding cost would be $6,000-10,000. This is almost 50% cheaper than the cost of wood siding for the same home. Another huge benefit to vinyl shakes is minimal maintenance. 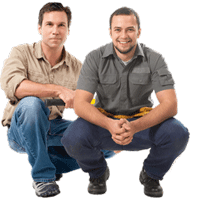 You pretty much don’t have to do anything besides occasional repairs and yearly cleaning. In terms of durability, you get what you pay for when it comes to vinyl. Shakes impression is already considered a premium product, so it will cost more than traditional vinyl lap siding. Still, we recommend selecting the highest quality vinyl boards, that are thick, durable and have good warranty. The only downside to vinyl shake siding is that it cannot be painted. This means that you should select your color very carefully, as you will be looking at it for at least the next 8-12 years. Vinyl shake manufacturers with the best quality and color selection include Novik, Cedar Shingles Direct, and Mastic Shingles by Ply Gem. Fiber cement siding is the high-end alternative to vinyl. It offers greater durability, longevity and better overall aesthetic. It is no surprise, that you can find beautiful shake siding options made of fiber cement. The most popular brand of fiber cement shakes is James Hardie. Expect to spend about $5-$9/sq.ft. for materials and installation. So, a 2000 sq.ft. house siding project will cost you an average of $10,000-18,000 if there are no complications. 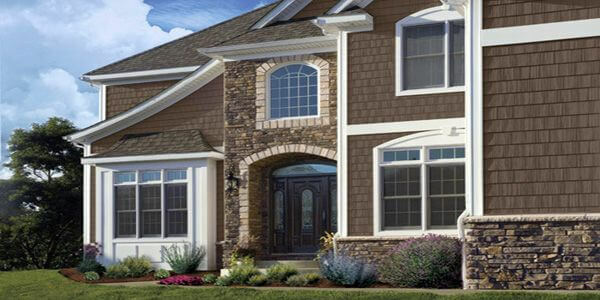 Allura is another high quality manufacturer that offers a beautiful array of shake siding options. It costs similar to Hardie siding, so your choice really comes down to personal preference. While fiber cement shakes are almost as expensive as natural cedar ones, they offer the tremendous benefit of greater durability and minimal maintenance. These shakes are insect, moisture, and fire resistant. Moreover, they are painted in a way that they will not peel, chip, or blister unlike painted natural wood. Compared to vinyl shakes, fiber cement offers a more authentic wood look with greater styles options. For example, in addition to straight edge shakes, you can have staggered edge varieties that offer the unique irregular look of real, hand-cut wood. Fiber cement shakes also have a highly realistic wood grain, because they are manufactured in molds with real wood. They are available in a variety of colors as well as a number of natural wood stains. In fact, fiber cement shakes look so much like real wood that they have been approved to replace old wood siding in many historic districts across the US, such as the Village of Rhinebeck, Kingston and LaGrange. Overall, you can get a very realistic wood shake look that will last for many years without the hassle of extensive and costly maintenance. Another durable and inexpensive alternative to natural cedar shakes, is engineered wood. This siding material is the newest product on the market; it has been developed in the last decades of the 20th century. Engineered wood is made of strands of recycled or waste wood, combined with sawdust and bonding agents. It is coated with a special resin binder and a moisure-resistant top coat. This formulation makes engineered wood very strong, durable and weather resistant. It is impervious to moisture, rot, mold and insects. It performs well in high-moisture areas and stands up to strong winds and hail. Overall, engineered wood is significantly cheaper than fiber cement siding. It costs an average of $3.5-8/sq.ft. for materials and installation. Thus, it will cost $7,000-16,000 to install engineered wood siding on a 2,000 sq.ft. house with a simple foot print. The most popular and best rated engineered wood products are TruWood by Collins, SmartSide by LP Building Products and Catawba by Georgia Pacific. Engineered wood siding requires very low maintenance, such as power washing a few times a year. To maintain its appearance, you will need to repaint the siding about every 5 years, because colors do tend to fade fairly quickly. Natural Cedar shake siding still remains popular with many homeowners. However, in recent years, due to high material, installation and ongoing maintenance costs, it has taken a back seat to the new engineered alternatives. People that still install natural cedar shakes, do so largely for aesthetic and personal reasons. They simply love the look, feel and smell of real wood, and would not want to trade it for cheaper, more practical siding materials. Cedar wood is the most expensive shake siding option. It costs about $6-9/sq.ft. for materials and installation. Thus, if you have a 2,000 sq.ft. house, you would spend around $12,000-18,000 on cedar shakes. However, this cost can be significantly higher, depending on your local contractor prices, architectural complexity of your home and other factors. In addition to high cost, one of the biggest downsides to natural cedar shakes is the ongoing maintenance. While wood is a long lasting material, you need to regularly take care of it, in order to keep its looks and durability. You would need to re-stain or re-paint your wood siding every 2-5 years, which is a costly and time consuming project. If you hire a professional to do this job, it can cost anywhere from $3,000-6,000 depending on the materials and size of your house. Moreover, if you live in a coastal area where there is a lot of moisture, we would not recommend installing natural shakes, because they will be a lot more susceptible to rotting and warping. The longevity and durability of any shake siding material you choose will only be as good as the quality of installation. Different siding materials have particular installation requirements, tools and professional knowledge, necessary to do the job well. Vinyl shake siding is the easiest and quickest to install. It is very light-weight and does not require any special tools or equipment. Even an experienced DIYer can install vinyl siding successfully. This is also the reason why installation cost for vinyl siding is the lowest. Next, in terms of ease of installation is engineered wood siding. Similar to vinyl, it is light-weight and does not require any special expertise. It installs quickly, and is therefore relatively inexpensive. Fiber cement siding is a lot more difficult to install. It is more heavy, requires special tools to cut, and training to do the job well. It is also more likely than engineered wood to crack or break during installation. This leads to more material waste and ultimately drives up the total cost. Difficult installation is one of the reasons why fiber cement siding is so expensive. We strongly recommend hiring a pro who has experience installing fiber cement siding products. Natural cedar wood siding is most difficult and expensive to install. This is especially true if you are installing shakes that have irregular edges. Your installer should have the expertise and tools necessary to cut the wood on site. It takes many years to acquire the skill to install real wood siding, which is why labor prices are very high. With any material, improper installation will lead to cracks, moisture infiltration, warping, blow-off and many other problems. You will have to pay a lot more to replace or repair poorly installed siding, than what you would have spent to hire an experienced installer. To get the best deal, get at least 3-4 detailed price quotes from your local siding companies. Make sure that the quote includes removal of your old siding, all materials, trim accessories, and labor. Very often contractors like to low ball the project just to get your business. Then, they start adding on extra costs once the job has started and you cannot back out. To avoid this, don’t fall prey to overly low estimates. Another smart way to save on installation is to source siding materials yourself. Very often, contractors will give you an overall higher price quote because most homeowners don’t know the real cost of materials. If you are able to buy siding materials on your own, you can save up to 20% off your total project cost.